Clock golf is a game based on golf, originating in the mid 19th century. Players putt a golf ball from each in turn of 12 numbered points arranged in a circle as in a clock face, to a single hole placed within the circle. 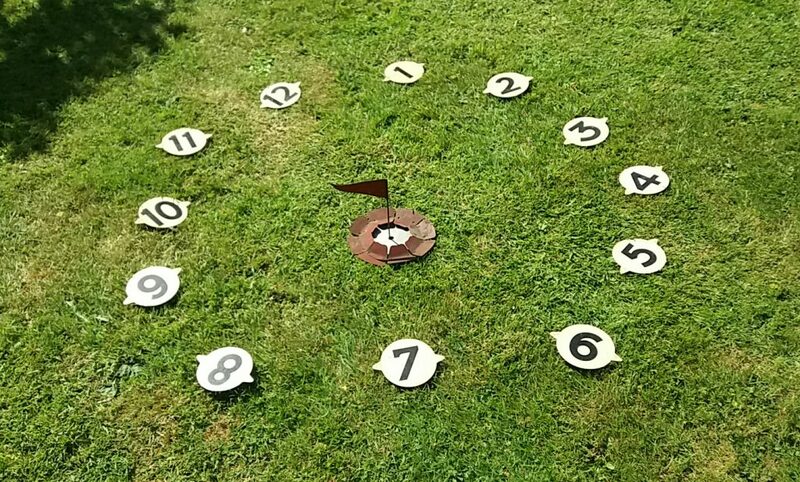 Clock golf can be played wherever there is space for an approximate circle of 10-30ft in diameter, shrubs and other obstacles can add to the interest. The hole is not placed centrally, so the 12 holes of the game can be of different lengths. This game consists of 12 vintage metal numbers and a metal “hole” (see photo) for the middle of the “clock”.